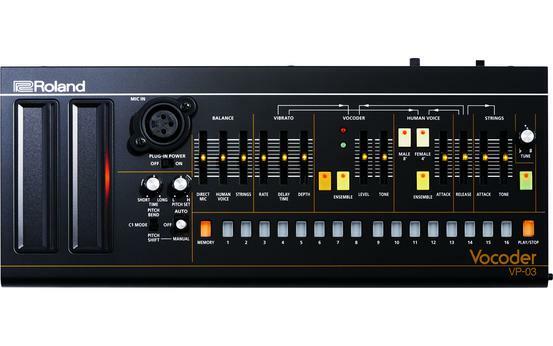 The VP-03 is a miniature version of the VP-330 Vocoder Plus, one of the most popular vocoders ever made. Part of the Roland Boutique series, the VP-03 brings together the worlds of synthesized sound and the human voice, using the latest ACB technology to accurately emulate the sound that made the original so influential. The VP-03 has the VP-330’s vocoder, human voice, and strings sound sources on board, and comes with a gooseneck microphone. And when paired with the optional K-25m Keyboard Unit, you’ve got the authentic VP-330 vibe in a reliable, low-cost setup that’s highly portable. There are new features too, including 16 Chord Memory setups and a Voice Step Sequencer for even more creative potential. Whether you want the classic, electro-infused “talking robot” sound or the expressive power of shaping synth sounds with the human voice, the VP-03 puts it all at your fingertips.